Loving Vincent is the world's first fully oil painted feature film, about the life and mysterious death of Vincent Van Gogh. IMDB: The world's first fully oil painted feature film, brings the artwork of Vincent van Gogh to life in an exploration of the complicated life and controversial death of one of history's most celebrated artists. 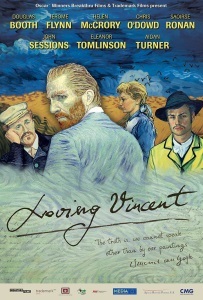 Chicago Tribune (3 stars): Dorota Kobiela has a deep passion for filmmaking and the works of Vincent van Gogh. She's brought those two loves together to create "Loving Vincent," the most visually stimulating feature film to be released in years. The film is the result of what can happen when a director is inspired to look beyond the celluloid canvas to tell her story. To achieve this, Kobiela used a selection of van Gogh paintings as the basis of the visuals for the production, and through the work of hundreds of painters she created 65,000 hand-painted frames of film that wove seamlessly the moments from one van Gogh work to another. In the world of animation, van Gogh would be the film illustrator and the other artists the go-betweeners. New York Times: “Loving Vincent” addresses its subject, the Dutch painter Vincent van Gogh, with two what-ifs — one marvelous and fantastical, the other empirical and pedestrian. What if his paintings, with their wild colors and vibrant brush strokes, had been able to move? And what if the bullet that killed him had been fired by someone else? I've seen a trailer for this, and it does look amazing - but there's something that doesn't sit right with me about it. Surely it must take hours of work to create even a simple frame, not to mention the years that must have gone into learning how. It feels wasteful to create thousands of paintings for each one to be shown only for fractions of a second. The process looks amazing. But is it a good story and does the technique enhance that narrative? This video from the BBC gives more insight into the production process. Yes, someone (hundreds of someones) painted each frame in oils. The story is all right - it's set after van Gogh's death and uses some of the portraits he painted as characters and weaves plot from rumors and theories around his death. It's not a "masterpiece" for sure, and the acting is at times wooden, but the effects are amazing. In this case the art supports the story - if was just filmed actors it would be a flop for sure. The conceit is the painted cells, and all the artists did an amazing job. My favorite parts were the flashback sequences, done in a greyscale style, but the whole thing is well done. We went to a matinee showing and the theater was 75-80% full. Worth seeing on the big screen just to see individual brush strokes. So... come for the art, tolerate the story? It feels wasteful to create thousands of paintings for each one to be shown only for fractions of a second. But ... that's what animation *is*, though, no? Animators is usually "smarter" about what is animated, and how (see: cels). Re-painting the entire frame is a ton of work, made way more complicated because they're mixing colors, too, which makes managing transitions all the harder. At least they're not always painting full frames every time - there appear seem to be some elements or backgrounds that are static for a second or two, which is where animators save time. Just saw this at the local cheap seats -- best $3 ever -- and this is a film that's worth paying to see in a theater. While the story isn't gripping, the visual spectacle is extraordinary. Every minute for 90 minutes I was boggling at the beauty on the screen.